Sestertius (RIC 2. 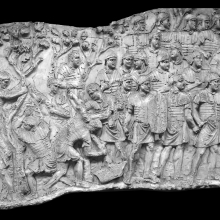 Trajan 475). Mint: Rome. Obverse: IMP CAES NERVAE TRAIANO AVG GER DAC P M TR P COS V P P: Bust of Trajan, laureate, right, with an aegis; Reverse: SENATVS POPVLVSQVE ROMANVS S C: Column surmounted by an owl; two eagles on the pedestal. Sestertius (RIC 2. 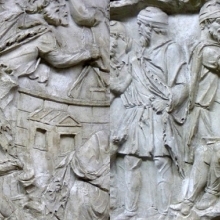 Trajan 475). Obverse: IMP CAES NERVAE TRAIANO AVG GER DAC P M TR P COS V P P: Bust of Trajan, laureate, right; Reverse: S P Q R OPTIMO PRINCIPI: Column surmounted by a statue of Trajan. Aureus (RIC 2. Trajan 292; BMC 449). British Museum (R.6046). Mint: Rome. Date: 112-117. Weight: 7.21. Obverse: IMP TRAIANO AVG GER DAC P M TR P COS VI P P: Bust of Trajan, laureate, draped and cuirassed, right; Reverse: S.P.Q.R. OPTIMO PRINCIPI: Column of Trajan surmounted with a statue of Trajan holding a scepter; the shaft of the column worn smooth; two eagles at the corners of the pedestal, the door to which is visible. Other examples of RIC 2 292: British Museum (1912,0607.129). Denarius (RIC 2. Trajan 292; BMC 455). British Museum (R.11712). Mint: Rome. Date: 112-117. Weight: 3.22. Obverse: IMP TRAIANO AVG GER DAC P M TR P COS VI P P: Bust of Trajan, laureate, draped, right; Reverse: S P Q R OPTIMO PRINCIPI: Column of Trajan surmounted with a statue of Trajan standing left, holding a scepter in left hand and globe in right hand; the shaft show spirals and dots; two eagles at the corners of the pedestal supporting garlands, doorway, inscription frame, and flanking victories on the pedestal. Other examples of RIC 2 292: British Museum (R.11710); (R.11711); (1868,0514.82); Yale University (2001.87.7375); (2001.87.7376). Denarius (RIC 2. 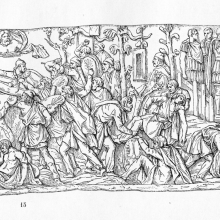 Trajan 293). British Museum (1934,0715.9). Mint: Rome. Date: 112-117. Weight: 2.9. Obverse: (same as RIC 2 292): Head of Trajan, laureate, right, with drapery on left shoulder. Reverse: (same as RIC 2 292): Column of Trajan surmounted with a statue of Trajan standing left, holding a scepter in left hand and globe in right hand; the shaft retains traces of the spiral; two eagles and traces of the door on the pedestal. Other examples of RIC 2 293 Denarius: British Museum (R.11709). Denarius (RIC 2.Trajan 307; BMC 523). 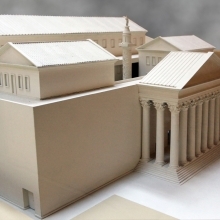 British Museum (R. 11737) Mint: Rome. Date: 112-117. Weight: 3.01. Obverse: IMP TRAIANO OPTIMO AVG GER DAC P M TR P: Bust of Trajan, laureate, draped, right; Reverse: COS VI P P S P Q R: Column of Trajan surmounted with a statue of Trajan holding a scepter in left hand and globe in right hand; two eagles at the corners of the pedestal (pedestal not visible in this example). Other examples of RIC 2 307 Denarius: British Museum (R.11738); (1912,0710.54). Denarius (RIC 2.Trajan 356; BMC 565) American Numismatic Society (1985.140.94). Mint: Rome. Obverse: IMP CAES NER TRAIANO OPTIMO AVG GER DAC: Bust of Trajan, laureate, draped, right; Reverse: P M TR P COS VI P P S P Q R: Column of Trajan surmounted with a statue of Trajan; two eagles at corners of the pedestal and a wreath with spirals and dots on column. Other examples of RIC 2 356 Denarius: British Museum (R.11755); (R.11756); (R.11757); (1844,0425.767). As (RIC 2. Trajan 600; BMC 1004) American Numismatic Society (1944.100.44754 [no image]). Mint: Rome. Date: 112-117. Obverse: IMP CAES NERVAE TRAIANO AVG GER DAC P M TR P COS VI P P: Bust of Trajan, laureate, draped, right; Reverse: S P Q R OPTIMO PRINCIPI S C: Column of Trajan surmounted by statue of Trajan; two eagles at base. 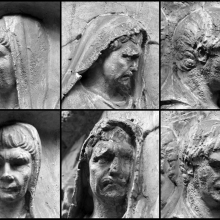 Other examples of RIC 2 600 (As): British Museum (1921,0303.1); (R.12065); (1936,0815.33); (1867,0101.2204). Sestertius (RIC 2.Trajan 600; BMC 971) American Numismatic Society (1995.11.515). Mint: Rome. Date: 112-114. Weight: 25.59. Obverse: IMP CAES NERVAE TRAIANO AVG GER DAC P M TR P COS VI P P – Bust of Trajan, laureate, draped on left shoulder, right; Reverse: S P Q R OPTIMO PRINCIPI S C: The reverse is not well preserved, but seems to bear the image better illustrated by ANS 1944.100.44747 and 1954.203.241. Other examples of RIC 2 600 Sestertius: British Museum (1872,0709.539); (R.12039). Sestertius (RIC 2.Trajan 601; BMC 971n) American Numismatic Society (1944.100.44747). Mint: Rome. Date: 112-114. Weight: 25.55. Obverse: IMP CAES NERVAE TRAIANO AVG GER DAC P M TR P COS VI P P – Head of Trajan, laureate, right; Reverse: S P Q R OPTIMO PRINCIPI S C: The Column of Trajan with eagles at its base, with garlands. The shaft is surmounted by a statue of the emperor. Considered a variant as the obverse bust is draped. Winged victories flank the dedicatory inscription on the base, the entrance to the pedestal and renditions of armor are also visible. Sestertius (RIC 2.Trajan 601; BMC 971n) American Numismatic Society (1954.203.241). Mint: Rome. Date: 112-114. Weight: 28.15. 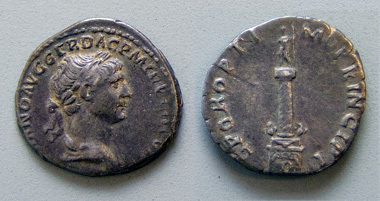 Obverse: IMP CAES NERVAE TRAIANO AVG GER DAC P M TR P COS VI P P – Head of Trajan, laureate, right; Reverse: S P Q R OPTIMO PRINCIPI S C: Nearly identical to ANS 1944.100.44747. Considered a variant as the obverse bust is draped. 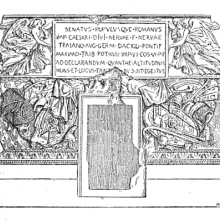 In addition, the pedestal does not include a rendition of the frame of the dedicatory inscription; the winged victories(?) occupy most of the surface area of the pedestal; no shields are visible. Sestertius (RIC 2. 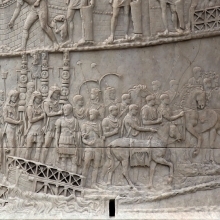 Trajan. 677) Obverse: IMP CAES NER TRAIANO OPTIMO AVG GER DAC P M TR P COS VI P P: Bust of Trajan, laureate, draped, right; Reverse: SENATVS POPVLVSQVE ROMANVS S C: Column of Trajan surmounted by a statue of Trajan; an owl at the pedestal. Sestertius (RIC 2. 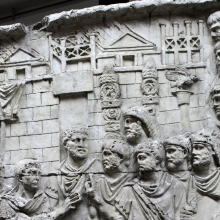 Trajan. 678; BMC 1024) British Museum (1869,0507.5). Mint: Rome. Date: 115-116(?). Weight: 23.41. Obverse: IMP CAES NER TRAIANO OPTIMO AVG GER DAC P M TR P COS VI P P: Bust of Trajan, laureate, draped, right; Reverse: SENATVS POPVLVSQVE ROMANVS S C: Column of Trajan surmounted by statue of Trajan standing left; traces of spirals on shaft of the column; two eagles with garland at pedestal. Sestertius (RIC 2. 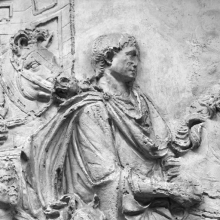 Trajan. 680; BMC 1016) British Museum (R.12074). Mint: Rome. Date: 114-115(?). Weight: 26.53. Obverse: IMP CAES TRAIANO OPTIMO AVG GER DAC P M TR P COS VI P P: Bust of Trajan, laureate, draped, right; Reverse: SENATVS POPVLVSQVE ROMANVS S C: Column of Trajan surmounted by statue of Trajan standing left, with scepter; traces of spirals on shaft of the column; two eagles with garland at pedestal; entry door visible. Sestertius (RIC 2. Trajan. 683). Obverse: IMP CAES TRAIANO OPTIMO AVG GER DAC P M TR P COS VI P P: Bust of Trajan, laureate, draped, right. Reverse: S P Q R OPTIMO PRINCIPI S C: Column of Trajan; two eagles at base. Dupondius (RIC 2. Trajan 603; BMC 995) American Numismatic Society (ANS 1944.100.44752 [no image]). Mint: Rome. Date 112-114. Obverse: IMP CAES NERVAE TRAIANO AVG GER DAC P M TR P COS VI P P – Bust of Trajan, radiate, draped on left shoulder, right; Reverse: S P Q R OPTIMO PRINCIPI S C: Column of Trajan surmounted by statue of Trajan; two eagles at pedestal. Other examples of RIC 2 603 Dupondius: British Museum (R.12058); (1931,1014.46); (R.12057). Dupondius (RIC 2. 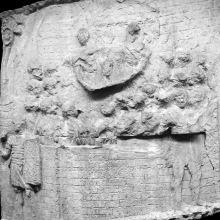 Trajan 679). Obverse: IMP CAES NER TRAIANO OPTIMO AVG GER DAC P M TR P COS VI P P: Bust of Trajan, radiate, right; Reverse: SENATVS POPVLVSQVE ROMANVS S C: similar to image on the Sestertius RIC 2 678.